Please, join Jinmuji/Takatoriyama hiking tour before Dokuonji Zazen. 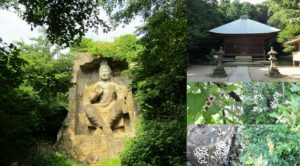 We will enjoy not only a hiking, but also a tour of historical Jinmuji Temple and Magaibutsu, big stone Buddha statue in the hiking course. The hiking course is surrounded by various green trees with fresh air, and it is also fun to walk along a stream valley with steep rocky slopes, where you need to hold chains for help. Please wear hiking or walking shoes, and bring a picnic snack/drink for a rest. You can join Zazen experience at Dokuonji temple after the tour. 14:30 Meet at Keikyu “JINMUJI”station. 17:30 Arrive at Keikyu “OPPAMA” station. ※ This tour will be cancelled because of weather condition, such as rain. ※ KSGG will not be liable for any accidents. If you are interested in participation, please fill out for the following application no later than October 4th(Thr. ), 2018.